Innovation: Frost & Sullivan, Frost & Sullivan, being a consulting firm specializing in innovative research methodologies. Innovative ideas produce innovative results that further the causes of the industries and target market segments within the satellite and space environs. Frost & Sullivan helps their clients leverage technology convergence to create better solutions for their customers, with services such as technology vision road-maps, technology convergence workshops and technology commercialization strategies. Since the inception of satellite communications (SATCOM), the parabolic reflector antenna has been the”go-to” technology that has enabled reception (downlink) and transmission (uplink) of data using radio frequency (RF) signals from Earth-based SATCOM terminals. The push for capable, inexpensive spacecraft has led to a manufacturing explosion of satellites in the 25 to 200 kilogram range — smallsats. 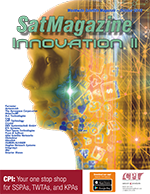 Uplink: Innovation — AtlanTecRF: Off-satellite testing... transforming the world of SATCOM, By Geoff Burling, Chief Executive Officer — This article was originally published in Microwave Product Digest, June 2018, and is republished with permission. Over the past half century, artificial satellites have transformed our lives, providing us with a host of information regarding our planet, its geology, its oceans, its weather and its people. Ramesh Ramaswamy is senior vice president and general manager of the International Division at Hughes Network Systems. In this capacity, he oversees the company’s sales, marketing and operations in the global market. CRP Technology, based in Italy, part of the CRP Group, has used their Windform composite materials and Laser Sintering technology to manufacture the 3D printed Tundra-M, the functional prototype of Hexadrone’s first modular, easy-to-use, unmanned aerial system (UAS) drone. Dense Wavelength Division Multiplexing (DWDM), with routes in the IP domain, has suddenly become a hot topic for the satellite industry. In many cases, there is now far further distances between the satellite dish and operating center. When sending signals over these longer distances, DWDM is the only reliable way to do achieve this without affecting signal quality. A dramatic growth of up to 30 billion IoT devices by 2020 is estimated to occur. This is a big number; however, one element in common for all IoT devices is the ‘I’ for internet, which, by direct implication, means that the internet needs to be connected through some form of medium. As forestry organizations look to safeguard employees, including firefighters and other first responders, they are increasingly turning to satellite solutions. Propulsion systems were a main topic of discussion at Space Tech Expo USA 2018 — not only on the Launch Systems day, but also on the Satellite Systems and Future Programs day.